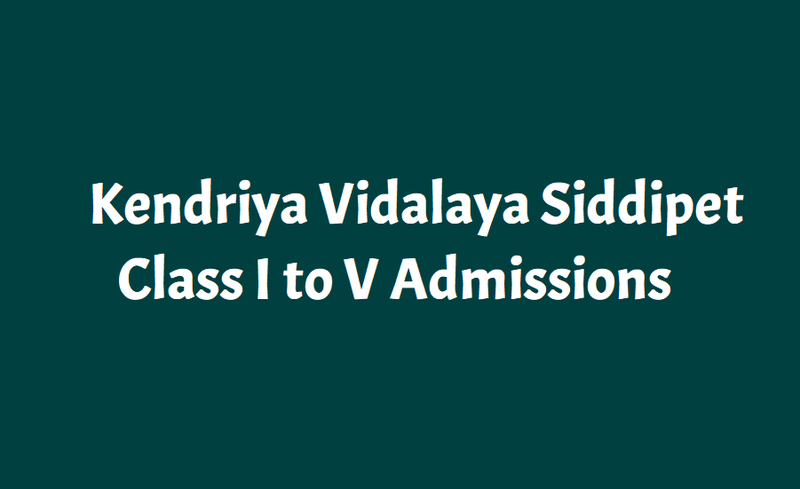 KV Kendriya Vidalaya Siddipet Class I to V Admissions 2019, Selection list Results: KV Kendriya Vidalaya Siddipet Class I to V Admissions 2019, Application form download: Kendriya Vidalaya Siddipet has given the amdissions notification on November 26 for admission into class I to V for this academic year. Applications are invited from the eligible students for admission into Kendriya Vidalaya Siddipet. For Example: A CHILD BORN ON 02.04.2013 IS NOT ELIGIBLE FOR CLASS 1 ADMISSION FOR THE SESSION 2018-19. 1. Date of Birth certificate on child name. 2. Defence personals should enclose D.O Part - II- Order Extract Copy with part II order number & date along with DOB Certificate. 3. Present Residential Address Proof ( on either of the parents name) . 5. No family accommodation Certificate for defence personals working in the Field Area, with present residential address proof attested by their controlling officer. 6. All the Central & State Govt. Employees should get the attestation from their controlling officer on the Application form itself as a proof of their service & Transfers. 7. For Single Girl Child ( S.G .C. ), an affidavit from the notary on a Rs. 10 /- Non - judicial stamp paper, stating that they have only ( Single ) Girl Child & no second male or female child. 8. Enclose Latest Service Certificate on the Office / Unit letter pad with photograph, employee code, Date of joining the Office / Unit & also should state that he / she is a Regular / Permanent Employee of this Office / Unit which comes under the Central / State Government under the .... Ministry. 9. Registration of Application form or Admission would be cancelled at any stage, if the particulars given in the application form are found wrong. Student's parents should download the application form (Registration form) from the KV Siddipet website and fill the correct inormation of yours'. Filled in application form and along with required documents send to the KV Siddipet or Submit to the KV Siddipet in personal on or before 12-12-2018.